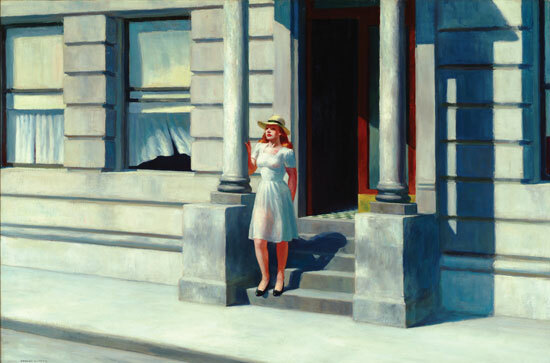 Starting today, residents and visitors to Delaware will see reproductions of paintings from the Delaware Art Museum on main streets and other open-air spaces in three counties. This “pop-up” exhibition is part of the museum’s celebration of its 100th anniversary year, which began last November. The reproductions of Edward Hopper’s Summertime (at left), Winslow Homer’s Milking Time and 13 other works of art are printed to scale and framed. In a press release, the museum’s Executive Director Danielle Rice said that “By sharing reproductions of some of our most beloved works of art, we’re hoping Art is Everywhere will spark curiosity and inspire both new and current visitors.” A map of the installations is available online, and there’s a list on the museum’s website exhibitions page. At the time, I criticized the DIA for missing the opportunity to solicit small donations via texting from passers-by. One commenter then told me that was too expensive (a surprise because other museums have successfully used texting, such as the Museum of Fine Arts in Boston for its drive to purchase Lime Green Icicle by Dale Chihuly). And the DIA, if I recall correctly, did not comment publicly but told me privately that Inside|Out wasn’t used to fundraise because the museum had recently completed a large campaign and that the outdoor show, marking its 125th anniversary, was outreach. That’s fair. So the Delaware Art Museum gets a pass on fundraising, thanks to the DIA. But I must quibble a bit with the selections. Although the museum says it is “best known for its large collection of British Pre-Raphaelite art, works by Wilmington-native Howard Pyle and fellow American illustrators, and urban landscapes by John Sloan and his circle,” how come five of the 15 selected works are by Pyle? And five by Pre-Rapahaelites? 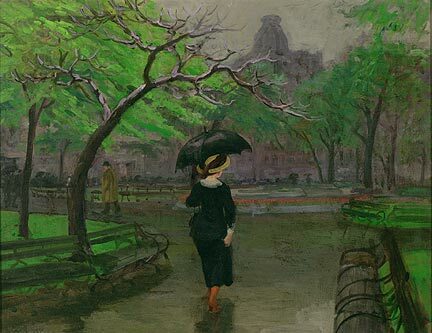 Only one is by Sloan, a better artist than Pyle; and the Delaware museum owns “the largest collection of art by Sloan, as well as the John Sloan Manuscript Collection, a treasure trove of archival materials.” That’s Sloan’s Spring Rain at right. I know the Delaware Art Museum is more varied than this selection, and while I believe in stressing one’s strengths, maybe this wasn’t the time for that. One brief note: Delaware only has three counties, which means that the museum is doing this pop-up exhibition throughout the entire state. Good for them! When selecting the works to reproduce, size was an important consideration. We wanted the works to be large enough to stand out but not too large to install. This left out our many Sloan’s which are small and our Burne-Jones which is huge.